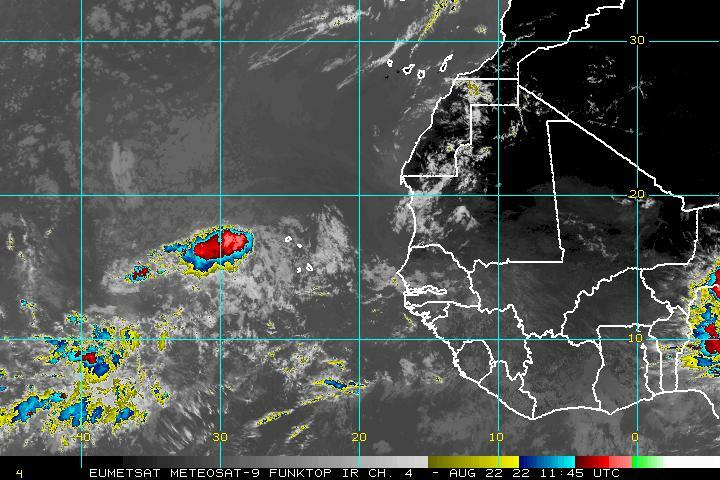 We have a strong disturbance that has now moved off the African Coast and is headed westward. There appears to be a mid level circulation here and conditions seem favorable for tropical storm development over the next several days at it continues to move toward the west. The system has a favorable environment. Models seem mixed on this down the road regarding the recurrent issues of shearing and dry air that have persisted over the Atlantic this entire hurricane season. Some models do seem to suggest that the environment may be for favorable for this one as it heads west however we are going to be in prove it to me mode on this one after what has occurred with the others as they have tired to head westward. Normally the Labor Day Weekend has one hurricane running around somewhere but it appears that this season might be one of those exceptions unless the system off the African coast really gets going. It is so far to the east however to be be relevant to us in any way. Looking ahead to the month of September which is usually the most active month, the trend is your friend so unless we see some wholesale changes in the pattern, for now I would simply guess that it will be more of the same until further notice. This el nino in the Pacific is just way too dominating a force. Anything that is going to happen is likely to be homegrown and nearby and not from the deep tropics. Wide view of the satellite loop and you can still see the circulation of Tropical Storm Fred as it meanders in the eastern Atlantic. Fred just won’t go away as it remains a minimal tropical storm. Convenction keeps bursting even through there is strong shearing and it is forecast to continue. This system will gradually weakend and disappear over the next 2 days. Convection off the southeast coast of the US continues to flare up, partly the remnants of Erika combining with a trough off the east coast. Conditions there do not seem favorable for any development as none of the models do anything with this in the short or medium term. Previous Post:MARINE FORECAST: SMALL CRAFT ADVISORY, HIGH RISK OF RIP CURRENTS.